November is National Alzheimer’s Awareness Month! 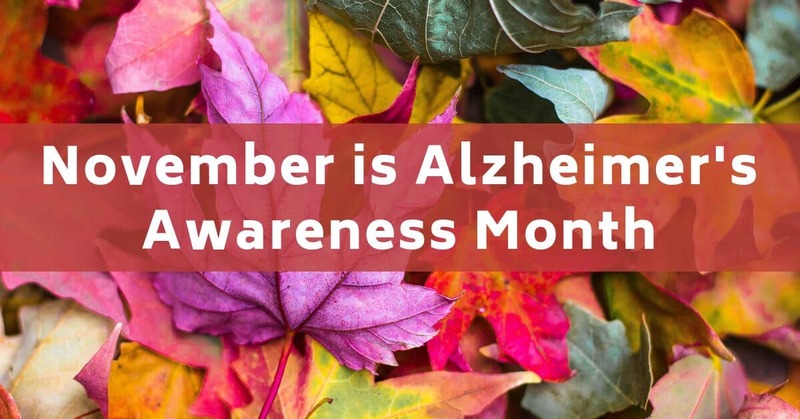 Every November since 1983, organizations and individuals have come together to raise awareness of this degenerative brain disease, and offer support and resources to those battling Alzheimer’s and other forms of dementia. Sadly, there is no cure for Alzheimer’s, but there are several things you can do to reduce your chances of developing this disease, or slow its progress. Did you know that one of the best things you can do to slow Alzheimer’s Disease is to treat your hearing loss? Alzheimer’s Disease is the most common form of dementia and is a degenerative brain disease that often affects older adults. In fact, roughly 5.4 million Americans have Alzheimer’s, and this number is expected to rise as the baby boomer generation ages. As connections in the brain weaken, protein cells start to form unhealthy bonds, and create a build up of cells knowns as plaques or tangles. These cells damage your neural networks, making it difficult for different parts of your brain to communicate. Not only that, but as cells get cut off, they begin to degenerate or die, and those with Alzheimer’s disease lose a lot of white matter in their brains, accounting for a lot of the symptoms of the disease. Like other forms of dementia, Alzheimer’s disease is most commonly recognized when a person starts to have problems with memory. It might be something small at first, like forgetting where you put your keys, but it soon becomes apparent that this isn’t just absent mindedness. You’ll start to forget more important things, like your doctor’s appointment, today’s date, or even what year it is. You may forget to turn off the stove before leaving the house, or get lost walking home from the park. As the disease progresses, people start to forget recent events, become irritable, and fail to recognize their loved ones. Finally, the plaques and tangles have spread to so many parts of the brain that even performing the tasks of daily life, like getting dressed, eating, or walking, become impossible. Sadly, there is no cure for Alzheimer’s Disease, but there are a few ways you can reduce your chances of developing the disease, or slow its progress. The best thing you can do is to keep your mind active. Use this time to start a new hobby – learn how to play that instrument you’ve always wanted to play or learn a new language! Anything that keeps your mind active, strengthens neural pathways, or builds new connections in the brain will help keep your brain cells healthy, and slow or halt the progress of Alzheimer’s disease. What does hearing loss have to do with Alzheimer’s Disease? If you’re living with untreated hearing loss, the thought of starting something new might be daunting. Have you been feeling isolated and alone? Do you often stay home rather than join your friends for social events? Those with hearing loss often struggle with anxiety, social isolation, and even depression. You know that feeling when you’ve asked someone to repeat themselves twice, but still can’t quite make out what they’ve said. They asked a question, so you hazard an answer, and hope you didn’t answer inappropriately, completely misread the situation, or offend them. When you can’t communicate easily with those around you, it’s common to feel embarrassed, or choose to stay home rather than face the fact that you can’t hear clearly. Living with untreated hearing loss has been linked to rapid cognitive decline and is a major risk factor for developing Alzheimer’s or dementia. That’s why treating hearing loss is crucial for brain health. Not only will treating hearing loss improve your communication, increase your quality of life, and help you enjoy life fully, it will give you the courage to try new things, stay active, and strengthen your brain. This November, do the right thing for your brain, and visit us at Roseville Diagnostic Hearing Center for a hearing test. Our team of hearing specialists will determine your level of hearing loss, and recommend the perfect device that will have you hearing clearly in every situation.